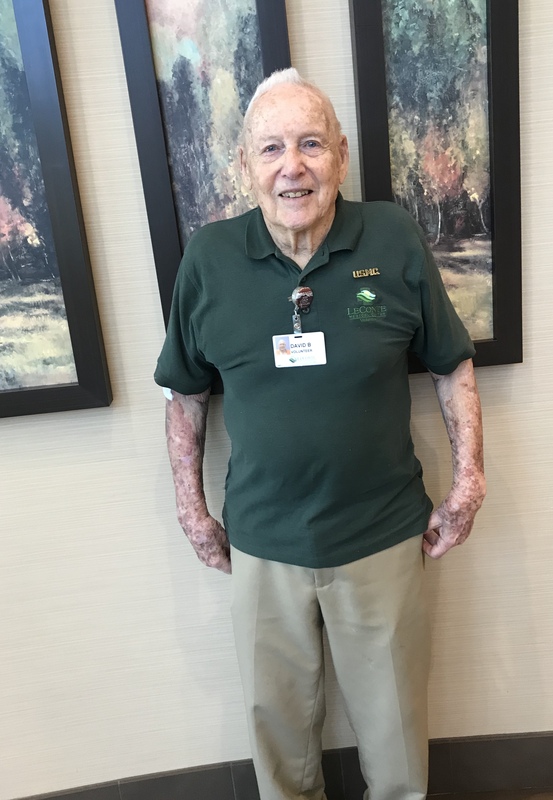 Meet David Barber, LeConte Medical Center’s oldest active volunteer. He will proudly tell you that he is 97 years old. He is still living life to the fullest by actively volunteering at LeConte Medical Center four days a week. He reports that he has not missed more than a week total during his nine years of service at the hospital. Barber declares that he just cannot imagine sitting around all the time and loves to keep moving. When he is not giving of his time at the hospital, he is serving at his church, where he has been a member since 1979. Barber is a World War II veteran. As a U.S. Marine, he served as an ordinance coordinator in the South Pacific from 1942-46. While serving our country he met Phyllis, his wife of 65 years, on a blind date. Phyllis was also serving in the Marines at the time. After his time in the Marines, Barber received his degree from the University of Tennessee and then coached football for the next 19 years, even starting a football program. He served as a high school principal for nine years and briefly worked for the American Red Cross as a safety service director, teaching first aid and water safety to hundreds of people. Barber is a Knox County native, so returning to Tennessee after his retirement made sense – but he did not stay retired very long after returning home. Instead, he served as a Sevier County deputy for 10 additional years. Barber now resides at Brookdale Senior Living and says he enjoys his time at LeConte because he gets to visit with folks and help them as needed. He also enjoys the free lunches for volunteers and advised that we should ALL try the tomato soup. To learn more about the many volunteer opportunities at LeConte Medical Center, visit www.lecontemedicalcenter.com/volunteer or call 865-446-7000 and ask to speak to Mary.